It’s well known that the global healthcare system is flawed. But HealthSapiens is changing that with decentralized healthcare. The four global healthcare models each have their own benefits and drawbacks. The United States specifically is in crisis , with costs exploding and access decreasing. A blockchain solution is designed to provide patients with the ability to access global healthcare providers based on fully transparent and measurable metrics such as cost, location, quality of care, provider experience, and outcomes after procedures. Additionally, a common currency can aid the process of cross-border payments, encouraging physicians to provide services globally. Physicians will be able to live and practice wherever they choose, while providing care to those in the most rural areas of their country (and potentially even the world). By adding a price transparency feature to the platform, patients can see and compare prices before using. This will naturally lower costs as patients gravitate toward more reasonable costs for comparable services. This will allow HealthSapiens 2.0 to switch to a value-based healthcare model, while still mitigating the skyrocketing costs for treatment. Imagine a healthcare system where everyone in United States and around the globe is a knowledgeable, savvy consumer of medical services, and plays an active role in purchasing and consuming the services they receive. In short, a blockchain solution can enable patients to become wholly involved in their healthcare decisions. To develop more conscientious healthcare users, plans and professionals will provide the information, financial incentives, and decision-making tools to allow consumers to make educated healthcare purchasing decisions. Using a blockchain model, patients will have access and control of their EMRs (Electronic Medical Records) at all times. Interoperable EMRs coupled with AI (artificial intelligence) could create process efficiencies and improve decision-making necessary to boost quality. Data could be better integrated into daily care, and patients could play a role in curating their own data. The data could include genetic, social, and behavioral patient information, as well as financial, clinical, and administrative records. It could be securely stored in the cloud and accessed on an as-needed basis via permissions written to the blockchain. 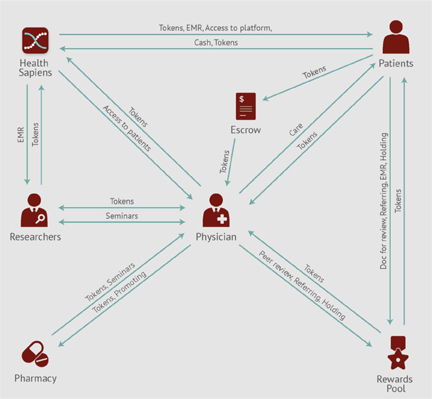 Blockchain technology enables a decentralized health information exchange, through a mapping and permission system for patients’ medical records. Most importantly, episodes of care will be memorialized on the blockchain and recorded as a pointer to the actual EMRs kept by the provider. Provider access to a patient’s file pathway is granted via a key signature only after patient authorization is submitted. By creating decentralized EMRs which are cryptographically-safe, secure, and permissioned, a blockchain solution lays the foundation for a new and powerful global healthcare network. As the architecture develops, the services on the platform will have the ability to grow into a comprehensive medical services platform with EMRs intuitively-interconnected. 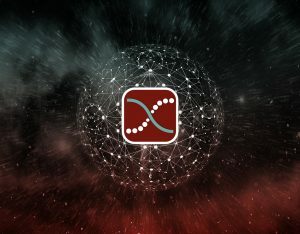 A blockchain-based healthcare platform uses blockchain technology to augment the quality of care provided by enabling interoperability of electronic medical records from legacy systems worldwide. The purpose is to empower patients to control their own data and partner with healthcare providers in a way that facilitates higher engagement, higher quality, lower cost, and ultimately the best outcomes in terms of healthcare service. Patient outcomes–defined as outcomes that are both accurate and lead to the best solution–can be peer-reviewed and the data and stats will be irrevocably recorded on the blockchain. 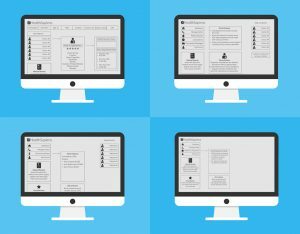 The patient names and details will be anonymous and each physician will have a rating based on their peer-review statistics. This transparency of outcomes will lead to higher quality care as bad actors are weeded out and patients can choose the best doctors to work with. Additionally, use of the blockchain and our new model of consolidating EMRs will mean patients can more easily access and send their medical records, creating better signals for diagnosis. Finally, the platform will encourage participants to actively engage in their own wellness through a rewards mechanism, where patients earn rewards for reaching goals or partaking in activities that contribute to their overall health. Other members of the healthcare field will be able to benefit from a blockchain healthcare ecosystem. Medical researchers can request permission to access patient EMR, aiding their research. Patients who wish to share their EMR will receive compensation in tokens, giving them ownership of their own data. Signatures on smart contracts will enable the transactions and record the permissions required. Our platform will include a feature where researchers and doctors can present workshops, classes and webinars in exchange for tokens, raising the bar for overall healthcare betterment through collaboration. Mandatory continuing education courses will also be available. 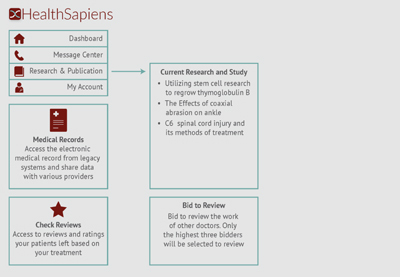 Pharmaceutical companies can request access to research data and also participate by promoting their medications or services, while being encouraged via the market to offer researched, cost-efficient alternatives of medications. 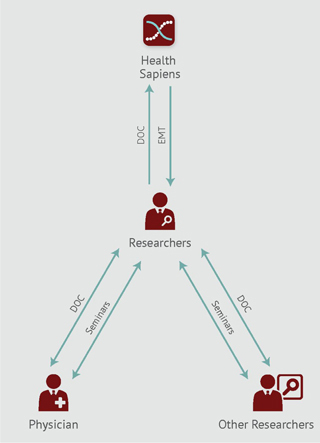 The ecosystem also encourages pharmacies to be transparent on side effects and publish results on clinical trials. A global platform will introduce a compensation model built on incentives made possible by the blockchain. 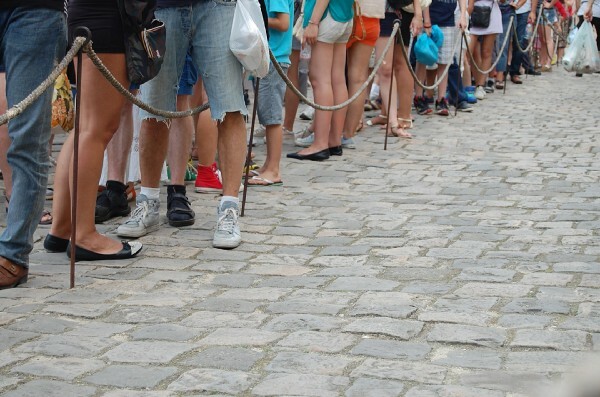 It will marginalize the need for intermediaries. For example, our platform will not receive revenue from an outside entity. Instead, it will run as a network fueled by HealthSapiens DOC tokens. Each action, which includes the rendering of a healthcare service, or the reviewing of outcomes, would be made possible by cryptocurrency. The blockchain is a decentralized authority, which enables the creation of a self-governed, transparent ecosystem. There is no single source that controls or centralizes the published outcome. While the interface enables P2P interaction, the blocks on the chain containing information on transactions, EMR, and reputation are not owned or controlled by any one entity. We envision the solution we’ve described above as a global remedy to the drawbacks of current healthcare models. Working together we can turn this dream into a reality. Please follow @healthsapiens on Medium and watch as we bring our decentralized healthcare ecosystem to the masses. Healthcare Blockchain technology is finally a reality. 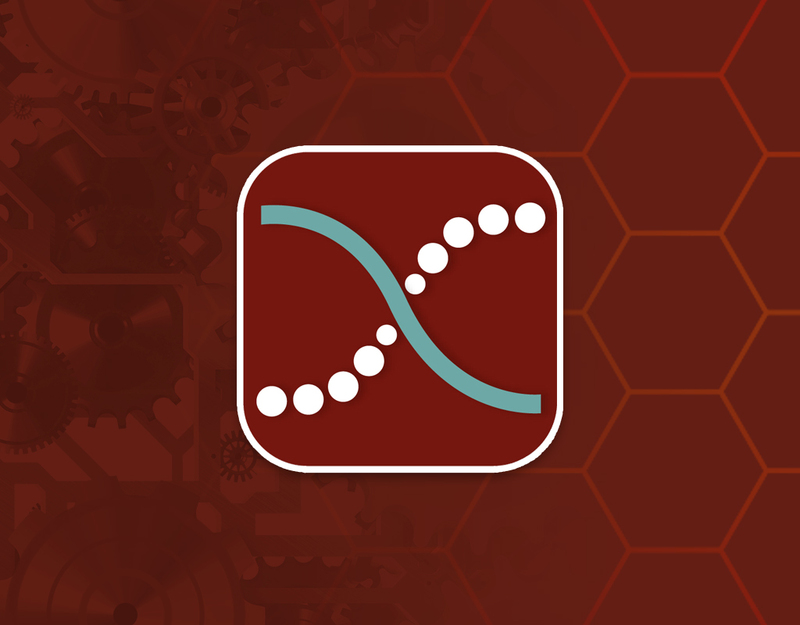 HealthSapiens envisions the democratization of healthcare: creating boundary-less freedom for choice while staying true to health and wellness principles for all. We do this through technological advances in communication, diagnosis, and collaboration. 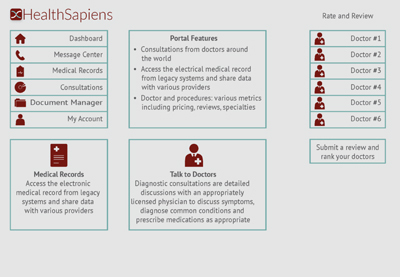 The current HealthSapiens 1.0 platform includes a client-facing, browser-based app for managing healthcare, interaction between physicians and patients, scheduling appointments, and saving EMRs (Electronic Medical Records) that have been manually collected by patients from various legacy systems. 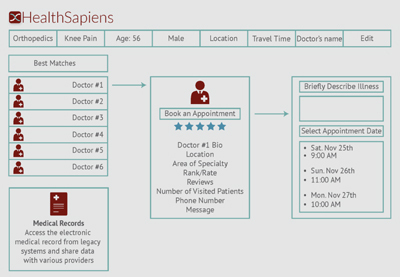 This platform will remain the interface for HealthSapiens 1.0. 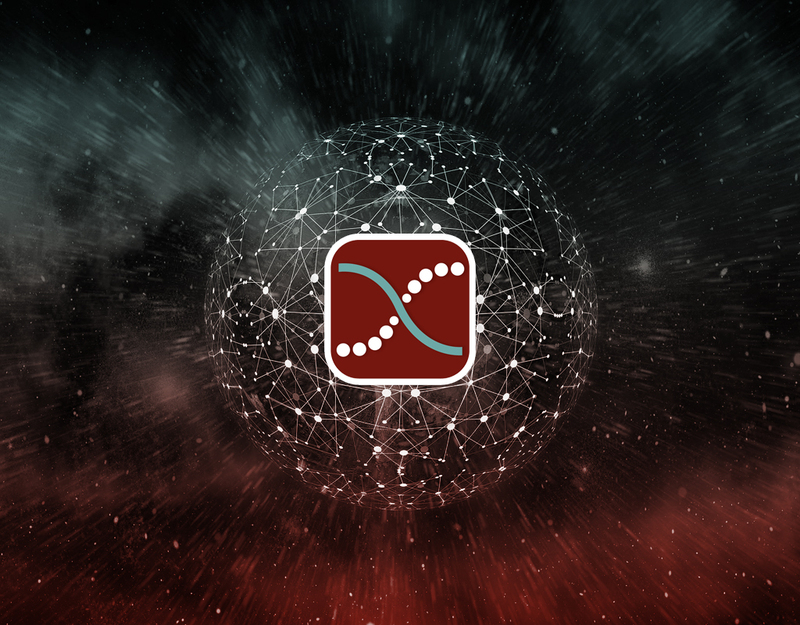 The new HealthSapiens 2.0 will leverage the Ethereum blockchain and include the addition of our DOC token, which will be managed by smart contracts. Payments in DOC and other transactions will occur automatically, adding trust to our global system. 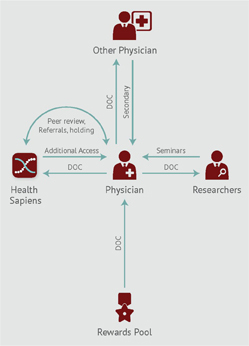 Physician outcomes—based on accuracy—will be peer-reviewed and stored on the blockchain for an immutable record of performance that further leads to trust and good outcomes. 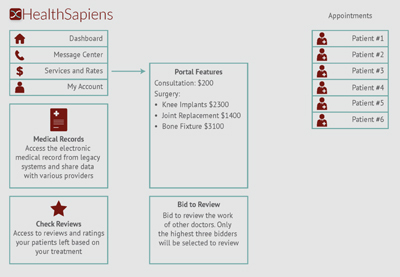 In addition, HealthSapiens 2.0 will create the HealthSapiens Legacy System, which, with patient permission, can automatically extract EMRs from various legacy systems worldwide and compile them to be stored in our secure and compliant off-chain database. Through Ethereum-based smart contracts, patients choose who to send access of their EMRs to, and can even choose to monetize and share their EMRs with researchers to earn tokens. Finally, we will move away from a telemedicine-only platform, introducing real-world care such as in-person doctor visits to our network. DOC tokens will be used to pay for tests, procedures, treatments, medicine, and all other healthcare-associated costs, making DOC the only healthcare payment system users will need. All of these additions are being developed by our HealthSapiens technology team. We are in the process of negotiating a partnership with The Massachusetts Institute of Technology (MIT) Media Lab for further development. Join our movement to build a system of healthcare that puts prevention first, places patients’ needs at the forefront of consideration, and sees physician access as a paramount priority toward creating healthcare equality. Together, we can see this dream become a reality. Follow us on social media and help us spread the word! Healthcare is a universal human right. According to the World Health Organization (WHO), health includes not just freedom from disease, but prosperous conditions for the soul1. Only under those conditions can all people live the abundant lives they deserve. 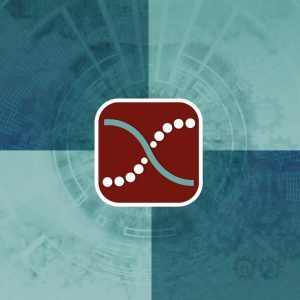 HealthSapiens envisions the democratization of healthcare: creating boundary-less freedom for choice and staying true to health and wellness principles for all. We are here to stay true to the ideals of healthcare through global collaboration and the progression of humankind, one patient at a time. Creating an incentive-driven ecosystem where all players are treated equally and rewarded properly, we envision a transparent and sustainable healthcare system that embodies efficiency, parity, cooperation, responsibility and candor for all users. We advocate the shift from a break-fix model of healthcare to one focused on prevention and the overall holistic health of populations, rather than episodic and transaction-based treatments. 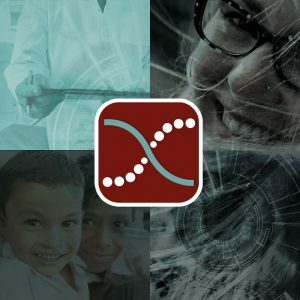 Our mission is to preserve the integrity of people’s health by creating a healthcare ecosystem that covers healthcare for all individuals from cradle to grave. This in turn incentivizes preventative care, therefore driving down costs and improving health in the long term. 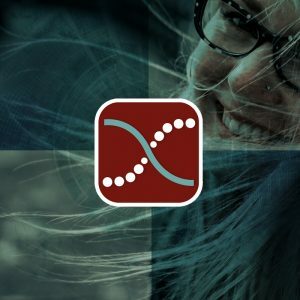 Our goal is to improve clinical effectiveness by lowering costs, allocating accountability evenly, increasing access to quality healthcare globally, and empowering our users to become engaged in their health. 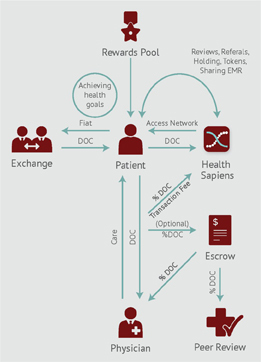 This vision drives the next phase of HealthSapiens’ technology: the introduction of the DOC token, a solution on the blockchain that improves access, accountability, transparency, and affordability to citizens worldwide. Be sure to follow @healthsapiens on Medium to learn more about us and what we’re doing to bring our decentralized healthcare ecosystem to the masses.